Mandy is a 2018 psychedelic action horror film directed by Panos Cosmatos and co-written by Cosmatos and Aaron Stewart-Ahn. A co-production of the United States and Canada, the film stars Nicolas Cage, Andrea Riseborough, Linus Roache, Ned Dennehy, Olwen Fouéré, Richard Brake, and Bill Duke. It premiered at the 2018 Sundance Film Festival on January 19, and was theatrically released on September 14, 2018 by RLJE Films. Mandy received critical acclaim, with praise directed at its style and originality, Cage's performance, Cosmatos' direction, and the action sequences. It is one of the last films scored by Icelandic composer Jóhann Jóhannsson, who died in February 2018. The film is dedicated to him. Somewhere near the Shadow Mountains in the year 1983, Red Miller lives with his girlfriend, artist Mandy Bloom, in a cabin near the lake. Red works as a logger, while Mandy has a day job as a cashier at a nearby gas station in the woods. She creates elaborate fantasy art, and Red admires her work greatly. They lead a quiet and reclusive life, and their conversations and behavior hint at a difficult past and psychological hardship. Red appears to be a recovering alcoholic and possible veteran, and Mandy recounts traumatic childhood experiences. On her way to work, Mandy walks past a van carrying the Children of the New Dawn, a deviant Manson-esque hippie cult led by Jeremiah Sand. Sand is struck by Mandy's beauty and orders one of his disciples, Brother Swan, to kidnap Mandy with the help of the Black Skulls, a demonic biker gang with a taste for human flesh and a liquid, highly potent form of LSD. At night, Swan drives out to the lake and summons the Black Skulls by blowing a mystical horn. After Swan offers them a low-ranking member of the cult as a sacrifice, they break into the couple's home and subdue Mandy and Red. The two female members of the cult, Mother Marlene and Sister Lucy, drug Mandy with LSD and venom from a giant black wasp before presenting her to Sand. Sand – a failed musician – attempts to seduce Mandy with his psychedelic folk music, telling her that God had told him to take anything he wanted. Mandy ridicules him, leaving him confused and infuriated. Seeking revenge, Sand stabs Red, who is tied and gagged with barbed wire, then burns Mandy alive in front of him. After nothing but ash remains of Mandy, Sand and his followers leave. Red frees himself, mourns over Mandy's ashes, goes back inside and falls asleep, exhausted and in shock. After waking up from a nightmare, he consumes a bottle of vodka, tends to his wounds, and shrieks in agony, grief, and rage. In the morning, Red fetches "the reaper," his crossbow, from his friend Caruthers. Caruthers provides him with freshly crafted arrows and information on the Black Skulls. According to Caruthers, the Black Skulls were drug couriers who turned murderously sadomasochistic after they had consumed a bad batch of LSD. Before Red leaves, Caruthers warns him that his odds of survival are poor. Red forges a battle axe and hunts down the bikers. Tracking the gang, he attempts to run down a trailing biker, but is captured in the process. At their hideout, Red manages to break free and kill the bikers. In searching their hideout he consumes some of their cocaine and tainted LSD, causing him to instantly and severely hallucinate. Seeking out a radio tower he envisioned earlier, Red encounters The Chemist, a mysterious drug manufacturer, who tells him where to find the Children of the New Dawn. At their makeshift wooden church in a quarry, Red kills Brothers Swan and Hanker with his axe and kills Brother Klopek in a chainsaw duel, sparing only the life of Sister Lucy. Traversing the tunnels beneath the church, Red finds Mother Marlene and decapitates her. He then finds Sand, taunting him by rolling out Marlene's severed head. Sand begs for mercy, but Red kills him by crushing his skull. He sets the church on fire and watches Sand's body burn before driving away, envisioning Mandy in the passenger seat of his car, while the landscape behind him now appears fantastical and otherworldly. On June 7, 2017, Nicolas Cage was announced as the star of the film. Production used the Arri Alexa camera, coupled with the Panavision anamorphic format, to achieve the film's old-school atmosphere. Legion M, an entertainment studio that allows fans to invest in and be part of the creation of films, was a production partner for Mandy and hosted a panel discussion featuring director Panos Cosmatos and others at the Sundance Film Festival in 2018. Cage made a surprise appearance at the event. The film premiered at the 2018 Sundance Film Festival on January 19. It began a limited cinematic release on September 13, 2018, playing at a maximum of 250 theatres, and was released on VOD on September 14. On review aggregator website Rotten Tomatoes, the film holds an approval rating of 91% based on 224 reviews, and an average rating of 7.63/10. The website's critical consensus reads, "Mandy's gonzo violence is fueled by a gripping performance by Nicolas Cage—and anchored with palpable emotion conveyed between his volcanic outbursts." On Metacritic, the film has a weighted average score of 81 out of 100, based on 30 critics, indicating "universal acclaim". Reviewing the film after its world premiere at the Sundance Film Festival, Nick Allen of RogerEbert.com praised it, writing that "for all of the endless feral performances that Cage has given, in movies good, bad and forgettable, Cosmatos’ style-driven, ‘80s-tastic passion for weird worlds and characters takes full advantage of Cage’s greatness, and then some." In a five-star review for Dirty Movies, Stephen Lee Naish called the film "a blood soaked revenge caper," praising Cosmatos for a "masterful approach" that "aligns him with Kubrick and Lynch in delivering perfectly believable and fully realized worlds and characters that operate within their own laws of physics." Meanwhile, film critic Christopher Stewardson said the film "is sure to become a cult favourite all of its own." At the 2019 Independent Spirit Awards, Benjamin Loeb was nominated for Best Cinematography for the film. ^ Kaufman, Anthony (17 December 2018). "Sundance Hits and Misses: How MoviePass, Politics and Streaming Boosted the Indie Theatrical Box Office of 2018". Filmmaker Magazine. Independent Filmmaker Project. Retrieved 16 January 2019. ^ "Mandy (2018) - Financial Information". The Numbers. Retrieved November 22, 2018. ^ Debruge, Peter (February 10, 2018). "How Composer Jóhann Jóhannsson Helped Change the Genre Cinema Soundscape". Variety. Penske Business Media. Retrieved March 6, 2018. ^ a b c d e f g Miska, Brad (January 16, 2018). "The 'Mandy' Poster Promises a Nicolas Cage Chainsaw Battle!". Bloody Disgusting. Retrieved January 21, 2018. ^ Benardello, Karen (January 19, 2018). "Mandy and A Boy. A Girl. A Dream: Love on Election Night Set to World Premiere at Sundance Film Festival". Shock Ya!. Anakando Media Group. Retrieved January 21, 2018. ^ a b c d e f g h "Mandy Details and Credits". Metacritic. Retrieved September 26, 2018. ^ Lodderhose, Diana (June 7, 2017). "Nicolas Cage To Star In Action Thriller 'Mandy' From SpectreVision, XYZ Films & Umedia". Deadline Hollywood. Penske Business Media. Retrieved April 18, 2019. ^ O'Falt, Chris (January 18, 2018). "Sundance 2018: Here Are the Cameras Used to Shoot This Year's Narrative Films". IndieWire. Penske Business Media. Retrieved August 24, 2018. ^ Canton, KC (January 21, 2018). "Nic Cage Crashes the Legion M Sundance Panel for 'Mandy'". Boom Howdy. Retrieved April 18, 2019. ^ Robertson, Adi; Bishop, Bryan; Robinson, Tasha (January 30, 2018). "Our favorite feature films from Sundance 2018". The Verge. Vox Media. Retrieved March 6, 2018. ^ "Mandy (2018) - Daily Box Office Results". Box Office Mojo. Retrieved April 18, 2019. ^ Pearson, Ben (August 17, 2018). "'Mandy' Advance Screenings Coming to 226 Theaters, Featuring Conversation with Nicolas Cage and Director Panos Cosmatos". /Film. Retrieved August 18, 2018. 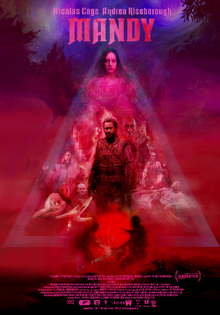 ^ "Mandy (2018)". Rotten Tomatoes. Fandango Media. Retrieved October 7, 2018. ^ "Mandy Reviews". Metacritic. CBS Interactive. Retrieved April 18, 2019. ^ Allen, Nick (January 20, 2018). "Sundance 2018: Mandy". RogerEbert.com. Ebert Digital LLC. Retrieved June 28, 2018. ^ "Mandy - film review". DMovies. September 22, 2018. Retrieved October 5, 2018. ^ Stewardson, Christopher (2018-10-13). "Review: Mandy (2018) - Our Culture Mag". Our Culture Mag. Retrieved 2018-10-13. ^ Warren, Matt (November 16, 2018). "These Are Your 2019 Film Independent Spirit Award Nominees!". Film Independent. Retrieved April 18, 2019.